The world if full of delightful places; we have found this to be one of them. Our Guesthouse is a tidy little craftsman home, trimmed with locally milled alder which was logged when the home was built in 2014. We charge $100/night plus cleaning with weekly discounts. The Guesthouse is set on 2 wooded acres in the Foothills area of Whatcom County, 100 yards from the Middle Fork of the Nooksack River and 20 miles from the Mt. Baker/Snoqualmie National Forest. Fishing or walking the river are options. Eagles are abundant during the winter salmon runs and our area is a favorite location for photographers. We've viewed beaver swimming upstream, we've had black bear and cougar through the property, and resident deer and eagles. It's pretty wonderful. The Guesthouse sleeps 4 comfortably with a downstairs bedroom and upstairs loft. The loft is reached by a steep stairway so please monitor if you have small children. Regrettably, the maximum number of guests, whether adult or child, is 2/bed, 4 total. There is a full kitchen but currently no television or clothes washer/dryer. Verizon Wireless gets good reception but we can't speak for other providers. High-speed internet, coffee, pancake mix and oatmeal are always provided. Regrettably, no pets. You'll find a highchair and Pack 'n Play in the closet that may prove useful to parents of a young child. Situated on a dead end country road, the house is nestled between the Middle Fork of the Nooksack River and the northern flank of the Van Zandt Dike in an area that boasts delightful views and abundant wildlife. Bike the road, walk the trails and river, watch the eagles. It is a quiet space with pleasant country neighbors. While it's just fine to sit inside and watch the sun go down, a significant number of guests come to either hike the trails, ski the slopes or photograph the eagles. There are several excellent locations for the latter within a very short distance. We'd be glad to help you locate them. Our guesthouse is a convenient location for a number of noteworthy outdoor events that occur in our county over the course of the year. In February, the Mt. Baker Ski Area--which holds the record for the greatest seasonal snowfall in a single year--hosts the Legendary Banked Slalom, a 3-day event that has made Mt. Baker famous. We are 40 miles from the ski area, an hour-long drive that is staggering in its beauty. Winter transitions to spring in late May with the incomparable Ski to Sea Race, a multi-sport event that draws international competitors, hundreds of participants and exploits the full range of our area's recreational offerings: skiing and snowboarding, canoeing, kayaking, running and biking. It all culminates in Fairhaven and is a signature event unlike anything else. We hosted a team this year for the first time! And, in June, the metropolis of Deming hosts the Deming Logging Show, another iconic event that dazzles the crowds whether or not you've ever fired up a chain saw. You'll find the logging show grounds just 10 miles west, in the opposite direction from Mt. Baker. Later in the month the Baker Blast, at the Northwest Soccer Park, holds forth and draws hundreds of youth from both the northwest states and from Canada. The soccer fields are another 10 miles beyond the logging show grounds. Snuggled in between these unique events is the ongoing charm and beauty of our area. Our road alone features a number of trails through both undeveloped DNR land and land held in trust by the Whatcom Land Trust. A rather spectacular seasonal display of Chum salmon can be witnessed in early winter by lucky visitors if your timing is good. Other nearby destinations lie only slightly further afield and include the idyllic Silver Lake Park, the charming little towns of Maple Falls and Glacier and, of course, the incomparable Mt. Baker National Forest with its abundant year-round recreational offerings: downhill and Nordic skiing, snowshoeing and sledding in winter and vast hiking trails and biking opportunities in the spring, summer and fall. And, as board members of the Friends of the Deming Library, we would be remiss if we failed to mention the location--a mere 5 miles away--of one of the most extraordinary country libraries in the state. The community built it and owns it and it boasts a delightful children's area, current technology, gracious librarians and 6-day-a-week access. It is directly across from the Nooksack Casino in beautiful downtown Deming. The growth of the Bellingham International Airport now means that direct flights to Bellingham are often a reality. Otherwise the airport connects easily with the Seattle International Airport. Our airport, which is just north of the city of Bellingham, is 50 miles south of Vancouver BC and 90 miles north of Seattle. We are 23 miles due east of the airport. It's a pretty straight shot on roads that are well maintained and offer 55 mph speed limits. Our little country road is also well maintained as well, although you'll have to slow down a bit as you travel down it to reach our guesthouse. Always watch for deer. In summary, although we are nestled into a fairly secluded area of the county we are easy to access year-round. In fact, the drive to reach us, particularly if you come up the South Fork Valley, is worth the time it takes: rivers, mountains and glaciers are visible from nearly all routes...unless you're driving at night, of course. While there is a Whatcom Transit bus stop at the head of the road (3 miles away), you are really pretty limited in your choices. You'll need a car. And please be aware: while we have a fairly strict cancellation policy, we will bank any lost funds for a future return so if you re-book in the future they will be applied. english, A little French and even less Spanish. We have lived adjacent to this property for 36 years. It's wonderful. Louise is a Washington native but Leaf had to return to the NW, the birthplace of his parents, after a childhood in Southern California. We retired a few years ago after careers in nursing (Louise) and school counseling (Leaf). Our two fine sons live within striking distance in Seattle and life has been very good to us. Making the guesthouse available for travelers has proven to be a lot of fun with a surprising number of guests being international travelers. We never imagined how satisfying this whole enterprise would be. We bought it five years ago but actually owned the property a decade earlier. This time around we had the original home removed--burned, actually, by our fire district in a practice burn--and started over. Same benefits as exist in the whole area: quiet, secluded, ample wildlife, charm. Beavers swim up the river on occasion and we've been visited by bear and cougar. We even managed to snap a photo of both. Eagles abound and a surprising number of guests are here to photograph them during the winter salmon run. Long winter nights are made warmer with the location of a fine little brewpub up the road. Life is very good here and it's a joy to share it. A highchair and Pack 'n Play are in the closet for the use of parents of young children. Shower, sink and toilet. No tub. Located 3 miles down on a dead-end country road. Very wooded. Foothills of the Mt. Baker National Forest. Middle Fork of the Nooksack River is 100 yards away along a path. There is easy access for a walk along the river. Heat pump serves as air conditioner. Current technology heat pump and propane stove. We will make the beds for you. Sort of. There is a propane free-standing stove that adds a bit of ambiance. The oven runs about 75 degrees warm so turn it down for a pizza. Quality beans, grinder and filters provided. Uh-oh, no cream, however. Most of the necessary condiments. Coffee, oatmeal and pancake mix provided to get you started if you failed to plan ahead. The kitchen is quite complete. BBQ, while somewhat unique, is available. Small table adequate for 4 people. Sort of. Bring your MP3 or iPhone and plug into the speakers. Vast lawn and even more vast forest. I wouldn't kayak the Middle Fork of the Nooksack, where the house is located, but we kayak Bellingham Bay and the nearby lakes. 2 bikes available that work just fine. Fine view directly west of the neighboring blueberry farm and sunsets. 40 miles from Mt. Baker Ski Area. Don't mean to put you off, but no parties or gatherings. It's really quite a charming area. You have access to the Middle Fork of the Nooksack River, a mere 100 yards away. Hiking, biking, skiing, kayaking Bellingham Bay. Eagles abound in the winter. Several charming restaurants within easy striking distance and a delightful brewpub a short ways up the road. For parents of infants, we have a highchair and Pack 'N Play that may be useful. 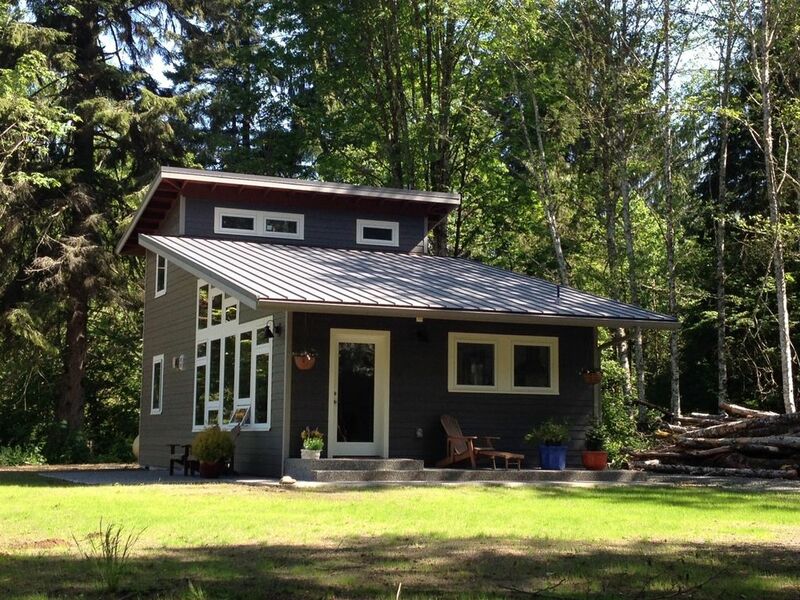 Fun modern cabin in the woods, great hosts. A wonderful modern guest house in a lovely setting. Thanks Nels. A delight having you stay. Leaf was a fantastic host. This property is very private and secluded. The house itself is well built and cozy on cool winter nights. Every amenity we needed was available including an espresso maker. It was comfortable and beautiful and everything we had hoped for. It was a delight having you stay Nikki. Hope to see you again. Thanks for the kind words. Fantastic cabin and location. Fells like home away from home. Traveled to the area for a Mt Baker ski trip and couldn't have chosen a more perfect accommodation. Thanks Levi, it was a complete pleasure having you stay. Thanks Jeff, a pleasure to have played a part. When used this cabin as a base camp for two days of snowboarding at Baker. It was above and beyond perfect. The eucalyptus honey was a great addition to the multiple teas that were available, along with the cribbage board for one more game before bed. Beds were comfortable and cozy. We even managed to wake up our son with the stereo and played Lion King and The Muppets Bohemian Rapsidy to encourage him to get out of bed. Everything was great. We have AT&T and found limited cell coverage, which is normal for that area. Janey, thanks for such a touching review. It was a complete pleasure having you stay! What a delightful family. And...well...we'll have to talk to ATT. We stayed at Leaf & Louise's guest house to get a jump on the mountain. It's a wonderful, private cabin with everything we needed. Leaf was very accommodating and helpful in getting some left-behind items back to us! Looking forward to our next visit. What a great bunch of guys, Mack. It turned out just dandy. Good work choosing such fine friends. Check in/check out is flexible if no one is on either side of your booking. Otherwise, check in at 1 pm, check out at 11 am. Please bear in mind, no pets and a maximum of 4 people. Don't mean to be nasty, it just makes the house work best for guests. Thanks for keeping it in mind.